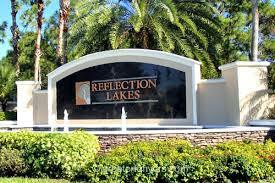 Reflection Lakes is a gated community of 800 homes including single-family homes, carriage homes and town homes in natural environment of lakes and preserves. Reflection Lakes is conveniently located in South Fort Myers. It boasts scenic lakes, special nature preserves, community sidewalks and underground utilities all bordering pristine Lakes Park. The clubhouse sits on a lake and features fitness center, billiards, administrative rooms, catering kitchen, heated community pool, children's playground, 4 lighted tennis courts, basketball courts, sand volleyball court and a putting green. Reflection Lakes is a gated community, so you'll definitely want to call The Smith Team to look around. Good luck, and happy house hunting.